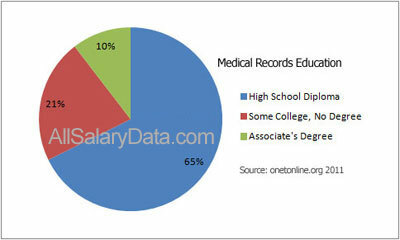 The mean annual wage for Medical Billing and Coding was $32,350. Medical billing and coding professionals are generally included in the category of health information and medical records technicians. Specializing in coding and billing, individuals work in an office and provide each medical procedure and diagnosis with a code using software for classification systems. The system determines the amount of reimbursement for medical providers when patients are covered by health insurance. Coders may be required to use multiple coding systems, such as those pertaining to long-term care, physician offices, or ambulatory settings. The mean annual wage in this career category reported by the Bureau of Labor Statistics in May 2010 was $32,350. The highest ten percent in the field earned $53,430 annually and the lowest ten percent had an annual wage of $21,240. Medical billing and coding employment are anticipated to increase by 20 percent from 2008 through 2018, which is much faster than the average for other occupations. Job prospects are expected to be very good and general surgical and medical hospitals, physician offices, and nursing care facilities will have the highest levels of employment. As of May 2018, California, Texas, and Florida had the highest employment levels within this career, according to the Bureau of Labor Statistics. 65% of individuals in this career have a high school diploma or equivalent. 21% have some college, but no degree. 10% hold an associate’s degree resulting from the completion of a program that includes anatomy, physiology, medical terminology, clinical coding and classification systems, and healthcare reimbursement methods. Taking high school science, math, computer, and health courses may increase chances of admission into a relevant educational program. American Academy of Professional Coders (AAPC). Board of Medical Specialty Coding (BMSC). These days, because of the high demand, a lot of people have become medical billers and coders. This career essentially pays very well especially if you obtain a Certified Professional Coder® certificate. The great thing about this industry is that you can find lots of medical billing and coding schools online so you will become a certified professional coder in no time. All you are required to do is get the resources you need for medical coding certification prep and effectively pass your certified medical coders examination. Even with medical billing and coding schools online, you are provided with the similar accredited education and certification. Transcriptionists listen to dictation created by healthcare professionals and transcribe this into correspondence, medical reports, and additional administrative material. Medical and health services managers, also called healthcare administrators or executives, coordinate, direct, supervise, and plan healthcare delivery.